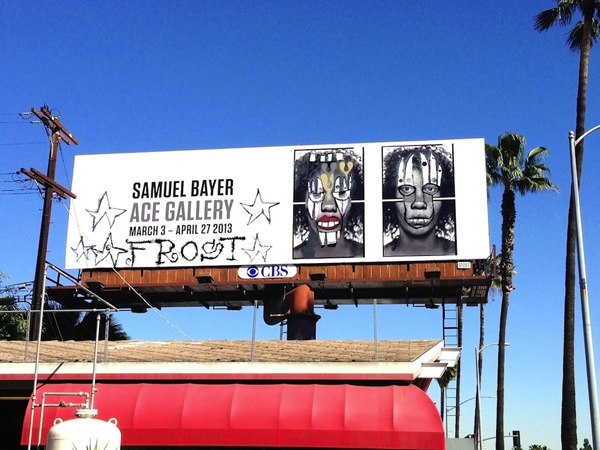 March 11, 2013 – Los Angeles, CA – In celebration of his solo fine art photography show at Ace Gallery Beverly Hills, Samuel Bayer designed a series of billboards around the Los Angeles area. The billboards featured artwork from Samuel’s show which consists on diptych and triptych portraits of female models. Shortly after going up, one of the billboards (located on Sunset Blvd east of Crescent Heights Blvd) attracted the attention of legendary painter and fine artist Phil Frost. Frost painted the billboard with two of his iconic characters plus signed the billboard with his name. The billboard, now estimated at a value of over $50,000 with the addition of Frost’s art, was stolen Monday March 4th between the hours of 6pm and 10pm. Samuel Bayer and Swing Media is offering a reward for any information on the billboard’s disappearance. Samuel Bayer’s show at ACE Gallery Beverly Hills runs through April 27th, 2013.